Making a pesto sauce is easy. Simply greens, nuts, garlic, and usually some oil, lemon, and Parmesan, right? But what if you are following a strict plant-based diet and do not want any oil or cheese? We’ve come up with a really interesting pesto recipe that we are sure you’re going to love. In this version we eliminated the oil completely so it is fat-free. We also made this a vegan dairy-free recipe by eliminating the cheese. 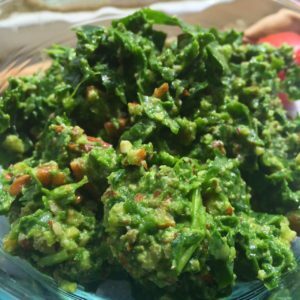 Combining spinach and basil gave this pesto recipe a delicious rich flavor, and the addition of pecans gave it just enough extra nutrition and delicious texture to make this an incredible dish! In a blender combine all the ingredients except for almond milk and tahini. Blend well. Create a paste by adding tahini or almond milk a little at a time until you reach the consistency you prefer. Spoon pesto into hot pasta or steamed vegetables and serve. The goal of the tahini or almond milk is to help blend the ingredients to make a paste. Add a little, add a lot, it is up to you to make this the consistency you want. You can also use walnuts or other nuts instead of pecans.